(Geneva Centre) – On the occasion of the International Day of Zero Tolerance for Female Genital Mutilation (FGM), Ambassador Idriss Jazairy, Executive Director of the Geneva Centre for Human Rights Advancement and Global Dialogue, reiterates the urgent need to eliminate all forms of violence and discrimination against women and girls, in particular FGM, which is a practice that violates women and girls’ fundamental rights such as their right to health, their right to be free from torture and cruel, inhuman or degrading treatment, and even their right to life. The UN estimates that at least 200 million girls and women around the world have undergone some form of FGM. The procedure is mostly concentrated in countries in Africa and the Middle East, but is also common in several Asian countries. Ambassador Jazairy underscores the fact that this practice is however not limited to these regions and unfortunately occurs in Western societies at a worrying rate as well, as FGM persists amongst immigrant populations living in Western Europe or North America. A report on Intensifying global efforts for the elimination of female genital mutilation produced by the UN Secretary-General in July 2018 deplored the prevalence of FGM around the world and showed that in order to fully eradicate it, it was imperative to address its root causes, including gender discrimination and gender inequality, which are similar to those of other harmful practices, such as child, early and forced marriage. The report deplored the fact that against the background of population movement across borders, the practice was taking on global dimensions, where increasing numbers of girls and women, including those from refugee and migrant populations, were subjected to it. 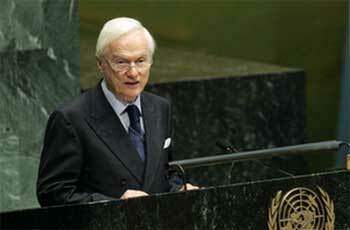 Furthermore, Ambassador Jazairy called for a concerted effort from international stakeholders, including international organizations, civil society, grassroots movements, and lawmakers, to raise awareness about the long-lasting consequences on women and girls of this cruel and obsolete practice, which is deeply-rooted in negative norms and stereotypes, and has no grounding or standing in Islam. “This custom has an enormous damaging impact on women’s physical and mental health, and perpetrates the pervasive cycle of discrimination and violence against women and girls within societies where it is still practiced,” he said. In this respect, the Executive Director of the Geneva Centre saluted the high-level political commitment to eliminating this practice showcased by the Government of the United Kingdom, which announced in November a £50 million pledge aimed at ending FGM by 2030. This financial commitment by the British government is the biggest donor investment aimed at eradicating FGM by an international donor. This pledge constitutes a positive step forward in raising the awareness of the international community on this woeful practice that will affect almost 70 million girls by 2030, unless drastic action is taken, according to UNFPA. Ambassador Jazairy strongly encouraged other States to follow suit. Finally, the Geneva Centre’s Executive Director reiterated that FGM represents a gross violation of human rights, and calls for its prohibition and full eradication, in line with Target 5.3 of Sustainable Goal 5 on Gender Equality.